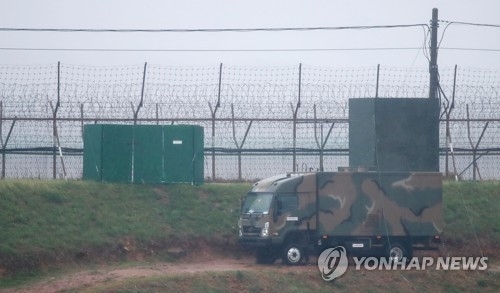 SEOUL, May 1 (Yonhap) -- South Korea's defense authorities will take down loudspeakers installed along the border with North Korea later Tuesday in a follow-up to their summit deal last week, officials said. An informed defense source said the North appears to have begun removing its own loudspeakers earlier in the day. "As (we) notified, we will today begin the removal of the loudspeaker broadcast equipment from front-line regions," a military official said. The military plans to allow the media to cover the start of the removal work at a border area in Paju, Gyeonggi Province, in the afternoon. The South began blaring anti-Pyongyang broadcasts using high-decibel loudspeakers along the border in 1963, most recently from around 40 locations. The program included messages critical of the North's communist system, news on South Korea and even K-pop music before the South switched it off just ahead of the talks between President Moon Jae-in and the North's leader Kim Jong-un. In their Panmunjom meeting, they agreed to cease all hostile acts and eliminate their means, including broadcasting through loudspeakers and distribution of leaflets, in the areas along the Military Demarcation Line. It's part of various agreed-upon measures aimed at building mutual trust and turning the Demilitarized Zone (DMZ) into a real peace zone. The Ministry of Unification, which handles inter-Korean relations, requested civic groups' cooperation on the implementation of the summit agreement. At times, conservative activists here, including some North Korean defectors, have flown anti-Pyongyang leaflets across the border by use of huge balloons. The North has responded sensitively to the leaflet campaign. "The suspension of scattering leaflets is of importance not only in easing military tensions but also protecting the security and safety of residents in border areas and preventing social conflicts," a ministry official told reporters. The official said the government will step up efforts for "communication' with related groups and deal with the issue in cooperation with other relevant authorities, including police and the Ministry of Interior and Safety.